Possible date: January 2020 - please let us know if you would be interested to join so we can decide whether or not to schedule it. 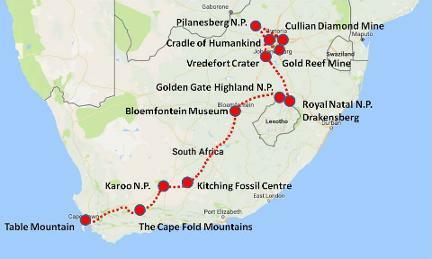 Includes bed and breakfast accommodation, transportation, entrance fees and geological guiding. Lunches and Dinners are not included. 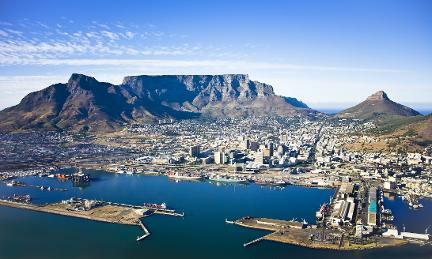 South Africa is a geological and wildlife marvel, a wonderland of geological superlatives and scenic beauty. It boasts the world's biggest gold and platinum deposits. The world's biggest diamond was found here. Many of the most important hominid fossils were found here, as were the best mammal-like reptile fossils. It also has fantastic National Parks teeming with wildlife, and wonderfully friendly local people. 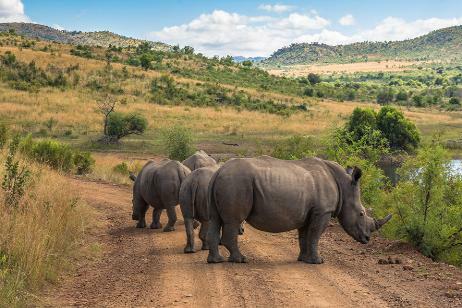 Rhinos in Pilanesberg National Park, the roots ofan ancient volcanic crater. Australopithecus africanus fossils were first discovered in the Cradle of Humankind World Heritage Site. 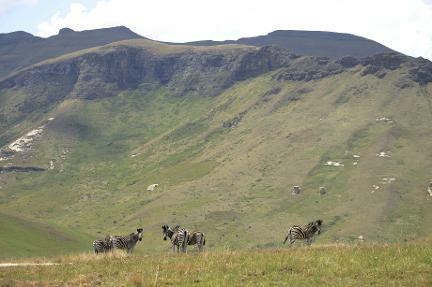 The amphitheater in the Royal Natal National Park, part of uKhahlamba-Drakensberg World Heritage Site. Day 1 - Arrive in Johannesburg. Our first night will be at the Southern Sun hotel which is 500m from the OR Tambo International Airport terminal building. There is a shuttle bus every 15 minutes. At 18:00 we will meet at the hotel's reception for our introductory meeting. Day 2 - Cullinan Diamond Mine and Tswaing Meteor Crater Geopark. We start our first morning by driving an hour to the Cullinan Diamond Mine. No name resonates through the world of diamonds like Cullinan. It was here that the world's largest diamond was discovered which now forms part of the British Crown Jewels. We take a 2-hour tour of the mine before driving another hour to reach the Tswaing Meteor Crater. Here we visit the visitor centre and see the impact crater that formed in the Pleistocene and is 1.13km in diameter and 100m deep. We then drive on a further 2 hours to Sun City where we spend the next 2 nights. Total driving time: 4 hours. Day 3 - Pilanesberg National Park. The Pilanesberg is the eroded roots of an immense volcanic caldera that exploded 1,300 million years ago. It is a circular complex of alkaline rocks that are 25km in diameter and rise 300m above the surrounding countryside. Inside the complex is the renowned Pilanesberg National Park which is one of the best game reserves in South Africa containing lions, rhinos, elephants, leopards and cheetah. We spend the whole day in the National Park examining the wildlife and geology. The night is spend at the same hotel in Sun City. Total driving: minimal - around the national park. Day 4 - Cradle of Humankind World Heritage Site and the Crown Mines Gold Mine. We start our day by driving for 2 hours to the Cradle of Humankind World Heritage Site. 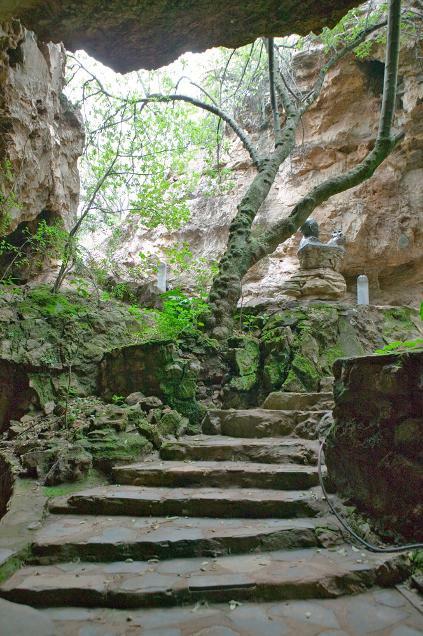 The site contains a complex of limestone caves, which were the discovery site of a 2.3 million year old fossil Australopithecus africanus. The caves have yielded over 1,500 hominid fossils in total, the largest number of hominin fossils ever found. After our visit we drive for a further hour into the city of Johannesburg to visit Gold Reef City. Gold Reef City is an amusement park built around the No.14 Shaft of the world-renowned Crown Mines, one of the richest gold mines the world has ever known. Here we can take a tour 220m underground and also visit the Gold Reef City Mine Museum. The night is spent in a Gold Reef City hotel. Total driving time: 2 hours. Day 5 - Vredefort Meteor Impact World Heritage Site. We start the day with a 1hr20 drive to the Vredefort World Heritage Site. The site is the largest verified impact crater on Earth, more than 300 km across! The crater is estimated to be 2 billion years old and the asteroid was 10-15km in diameter. The crater has now eroded away leaving the Vredefort Dome which is a partial ring of hills, 70 km in diameter. The rocks are a very unusual granite and a pseudotachylite which formed by the force and melting effect of the impact. To best appreciate the unique geology of the site we are led on a guided walk by a local geologist. We then drive a further a further 3 hours to reach Harrismith where we spend the night. Total driving 3hr20. Day 6 - Royal Natal National Park part of uKhahlamba-Drakensberg World Heritage Site. This morning we drive for an hour to reach the Royal Natal National Park. 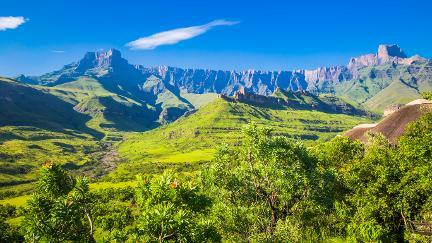 In the park we spend the day walking admiring the views of the amphitheatre and Tugela Falls which are the highest in Africa and second highest in the world. We then drive 1hr40 to Golden Gate Highlands National Park where we spend the night. Total driving: 2hr40. 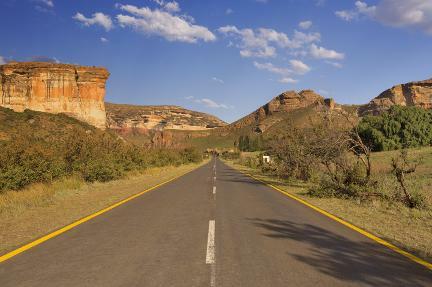 Day 7 - Golden Gate Highlands National Park. We spend the morning in the national park and join a local geologist on a geological tour to see dinosaur and mammal-like reptile trackways. In the afternoon we drive 3hr20 to the town of Bloemfontein. Day 8 - The National Museum, Bloemfontein. The morning is spent in Bloemfontein and we visit the excellent museum which has a large collection of fossils found in South Africa's Karoo basin. 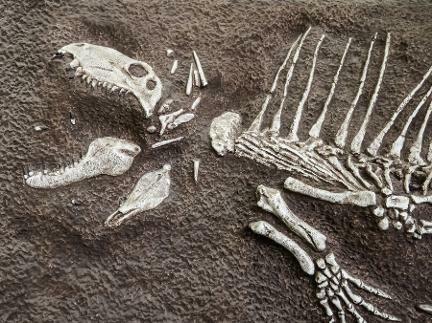 Amongst the exhibits is the most complete dinocephalian skeleton ever to have been discovered. In the afternoon we drive on a further 4 hours to reach Ganora Guestfarm where we overnight and which is the site of many fossil discoveries. Day 9 - Fossils at the Ganora Farm Museum Kitching Fossil Exploration Centre. 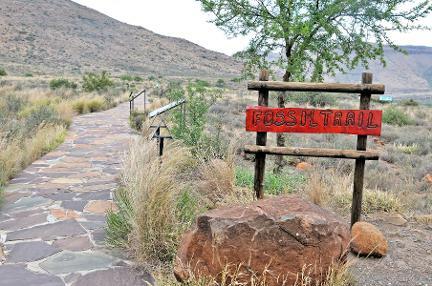 In the morning we visit the Ganora Farm Museum, which displays many of the mammal-like reptile and Glossopteris tree fossils that have been found on the farm. We then join our host for a tour of his farm and he shows us some of his fossil discovery sites. We then drive 15 minutes to the neighbouring Kitching Fossil Centre where we can see additional fossils and life-sized models. Later we then drive 3 hours to Karoo National Park where we spend the night. Day 11 - Table Mountain, Cape Town - The morning is spent driving a further 3 hours to Cape Town. Along the way we pass exposures of fresh tillite, Ice Age deposits from 300 million years ago, and beautifully folded rocks before the perfectly flat-topped Table Mountain comes into view far ahead, as we finally arrive at the Cape and journey's end. We spend the afternoon visiting Table Mountain which has been voted one of the seven natural wonders of the world. The night is spent in Cape Town.